Most metal fans are keenly aware of King Diamond. He's a scene legend. However, a famous person knows they've truly arrived when something is named after them. A street. A stadium. A rare species of fern. A bug. Or, as in the case of the King, a fossil! Yep, the metal legend has been immortalized with a fossil named the Kingnites Diamondi. The fossil itself comes from a 420-million-year-old worm with monstrous jaws and King Diamond recently turned up at a ceremony saluting its metal ties. According to Blabbermouth, the King visited the new Heavy Metal and Punk Fossils exhibit, which takes a lighthearted view of natural history and centers on bizarre fossils named after rockers. The Kingnites Diamondi is currently on display at the exhibit. The fossil was christened by Professor Mats Eriksson, who hails from Lund, Sweden. 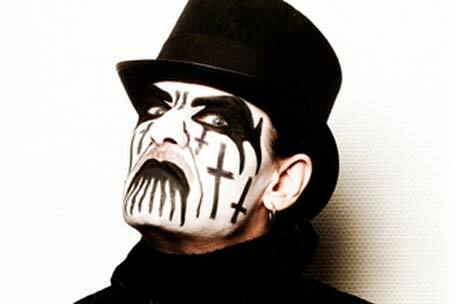 It was only right that King Diamond participated in the opening reception for the exhibit, which is housed at Geomuseum Faxe in his native Denmark, so that he could get up and close personal with his namesake fossil. He chatted with visitors, took photos and signed autographs. Museum curator Jesper Milàn said, "It was an unbelievable honor for us that King Diamond came by and participated in the opening reception, and luckily, he was very pleased with the exhibition and thought the model of Kingnites Diamondi was great and very metal in its raw brutality." Motorhead frontman and bassist Lemmy Kilmister also had a fossil named after him. The Kalloprio Kilmisteri is also an ancient, scary worm. Eriksson is clearly showing both his age and his metal preferences by choosing to name fossils after two of metal's most revered elder statesmen. The exhibit is certainly fun for European headbangers, since visitors can learn the story behind the fossils and the rockers after which they are named, and why they were christened as such.